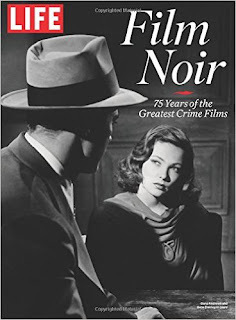 Classic Movie Man: Book Review: "LIFE Film Noir: 75 Years of the Greatest Crime Films"
Book Review: "LIFE Film Noir: 75 Years of the Greatest Crime Films"
When someone tweeted the cover of LIFE Film Noir: 75 Years of the Greatest Crime Films, I had to go out and buy it. After all it had Dana Andrews and Gene Tierney on the cover! What it is is a 96-page glorified magazine with neat images from some of the most famous films noir. Author/journalist J. I. Baker is credited on the masthead as editor and writer. The brief introduction is credited to him, but the essays that accompany the films don’t include bylines. The film profiles are short and the entire book can be read in under an hour. Some of the other film choices are obvious: Double Indemnity (1944), Laura (1944), Mildred Pierce (1945), and Out of the Past (1947). The book also looks at more modern films (Neo Noir) like Bonnie and Clyde (1967), Dirty Harry (1971), Chinatown (1974) and Taxi Driver (1976). Designed to sell on the newsstand along with magazines like People and Us, 75 Years of the Greatest Crime Films is worth a look, but at $13.99 retail, it may be a bit steep for what it offers. You can pick up your copy wherever magazine are sold and from Amazon. But a trip to your local library may be the most economical option.